Dr. Behman is an Ordained Interfaith Minister. 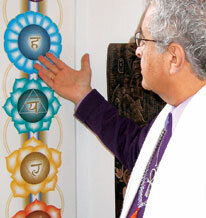 He uses his unique Spiritual Counseling Techniques that help the client to identify and replace the old beliefs and values that were blocking the alignment of the life energy fields with the soul. This technique brings hope and faith into the spiritual path. You will feel the joy of living from the higher self according to your divine plan and experience authentic love and spiritual well-being.